A rather hot topic of modern research in quantum gravity has hit the news stands. This is the “firewall” business that got started in Santa Barbara. Dennis Overbye has a piece on it in the New York times. Have fun reading it. In quantum mechanics a state is described by a ray in a Hilbert space, and an observable by an Hermitian operator acting on that Hilbert space. After measurement, the state collapses to an eigenstate of the operator representing the measurements. The probability of any outcome is given by the Born rule. Erm, that might not have been all that clear. Let me rephrase that: in quantum mechanics, the state of the system represents, well, the state of the system (a rare occasion in physics when the term used makes any sense, and even has some relation to the idea it signifies). This means basically all the information specifying the contingent facts about the particular history of the system in question. This leaves only the question of accessing that information. Let’s play a little game, hopefully illustrating something about quantum field theory, quantum gravity, and all that other good stuff. We already know that particles can be viewed as excitations of fields, which are some continuous media filling up space. One way of illustrating this is by drawing a checkers board filled with black or white squares (on second thought, most of what is below might be more intuitive to the go player). 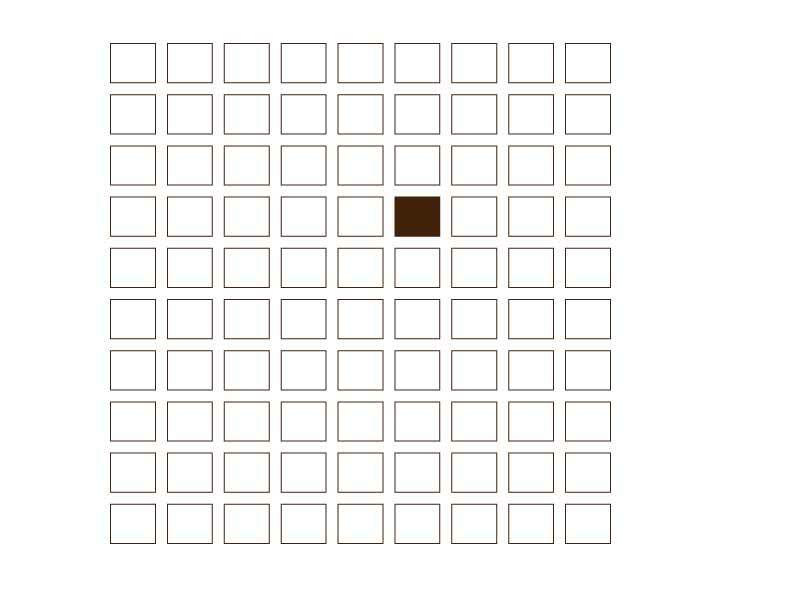 We say that the square is white when the field is not excited, and black when it is excited at some location. In other words, it costs a fixed amount of energy to paint one of the squares black (actually these turn out to be dark brown, which is some kind of sad statement about my eyesight). Last time I had time to write a detailed physics post, I got to the point of declaring fields as the fundamental entities of nature. Since we can get particles from quantizing (certain kinds of) fields, and since the pointlike particles are confusing and paradoxical, we don’t really need them. Our basic theory of nature is then a (quantum) field theory. About a couple of years ago I received, to my surprise, an invitation to be the token string theorist in the annual conference “Loops 2007”. Over the years, especially during my long term stays at the Perimeter Institute, I befriended quite a few people from the loop community. Mexico is always a pleasure to visit, and there is practically no jet lag involved, so I could just fly in and out of there, in between getting a few days to go around with my camera and enjoy a picturesque colonial town. So, I thought to myself, why not? Naturally, one hour is not enough for such a large topic, so I had to narrow it down to cover just one major issue, and I chose to talk about background independence. Among all the fundamental differences between different approaches to quantum gravity (including for example, what does it mean to quantize gravity), this to me seems like the one needing most clarification. It is the one expression most likely to be used as a mantra, or as the one answer fitting almost any question, so basic and primary that evidently no elaboration is needed. So, I’ve done my part now, I have given the talk, which was a real pleasure, and I have now expanded it to this writeup. In the process I have learned that writing a polemic is not as easy as it looks…I hope someone enjoys reading this, and it provokes a few useful discussions. I’d be happy to answer questions if it is evident they are formed after reading what I wrote. Update: I guess the link to the writeup is not going to be available till tomorrow, apologies for the bad planning. In the meantime anyone interested can play the traditional lunch-time game of trying to guess what is in a paper you haven’t read. Oftentimes you discover things more interesting than the actual paper, that may well be the case here. Update (September 23rd): I am not sure how much I would trust someone who cannot manage to submit a simple PDF file to the arXiv, but here it is finally, knock yourselves out.